After two days of intense competition, Whitworth’s forensics team brought home 25 awards, including a third-place Sweepstakes Award for the team’s overall performance, from its second tournament of the season, the Coyote Classic, in Caldwell, Idaho. The Whitworthians have earned a total of 53 individual and four team awards so far this season. 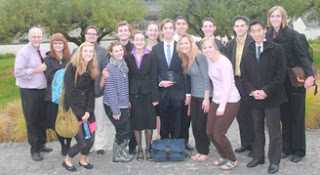 For the second tournament in a row, members of the Whitworth team made up the tournament’s top four debaters. Currently in the Northwest forensics conference standings, the Whitworth team ranked ahead of a number of nationally known programs in the region, including schools from NCAA Division I, II and III. Ingram says that the team provides qualified students with a great opportunity not only to grow in rhetoric and communication skills, but to compete against schools of a variety of sizes and disciplines. He encourages Whitworth students of any major to challenge themselves and contact him about joining the team. A forensics tournament features several events. Each participant can choose from 11 genres of speech in addition to the debating portion. The tournament progresses in rounds. Students deliver speeches on varying topics from fields such as ethics, literature and politics. A judge then evaluates their arguments on a scale of one to five, with one being the highest. Forensics allows students to develop their critical thinking, to explore new methods of effective communication, to build a good team work ethic and widen their perspectives. Other participating teams at the Caldwell tournament hailed from Boise State University, The College of Western Idaho, The College of Southern Idaho, Northwest Nazarene University and The College of Idaho. At the Coyote Classic, there were several outstanding performances by Whitworth students. In the Varsity Division, Sam Director, ’15, took first place in Extemporaneous Speaking and second place in Informative Speaking. Krister Johnson, ’13, took second place in Communication Analysis and second place in Impromptu Speaking. In the Varsity Debate Division, Johnson reached the semifinals and Director placed fourth. In the Novice Division, Matt Hancock and Alex Hoffman, both ’16, placed in the top six in Informative Speaking. Hannah Tweet, ’16, came in first in Informative Speaking and second in Prose, while Jonathan Kim, ’15, placed second in both Informative Speaking and Impromptu Speaking. Chris Burnett, ’16, took first place in Extemporaneous Speaking, while Madison Garner, ’16, followed in second. By the competition’s end, Whitworth students filled all four of the semifinalist spots open to 31 debaters in the novice debate division. Madison Garner and Hannah Tweet, both ’16, were declared the undefeated winners of the tournament, while Chris Burnett, ’16, and Andie Ingram, ’15, were semifinalists. In addition, the top five Debate Speaker Awards all went to Whitworth, with Madison Garner taking first, Chris Burnett second, Andie Ingram third, freshman Bri Miller fourth and Alex Hoffman fifth. Other members of the Whitworth team include Evan Barnes, Molly Daniels, Lilly Davis and Addison Koneval, all ’16, and Jacob Wilson, ‘15. On November 2-3, 2012, the Whitworth team will compete at the Lower Columbia College tournament, in Longview, Wash.